We’d love your help. Let us know what’s wrong with this preview of To Touch The Sun by Laura Enright. To Touch The Sun is the debut novel by author Laura Enright. 1916: France, The Great War. Narain Khan was 25 when he left his native India to fight in the trenches of the Western Front during WWI. It was his hope that he could stay on after the war to pursue his dream of studying the culinary arts and becoming a world class chef. Instead, he fell to shrapnel amidst the carna To Touch The Sun is the debut novel by author Laura Enright. Narain Khan was 25 when he left his native India to fight in the trenches of the West­ern Front dur­ing WWI. It was his hope that he could stay on after the war to pur­sue his dream of study­ing the culi­nary arts and becom­ing a world class chef. Instead, he fell to shrap­nel amidst the car­nage of that bit­ter war. Car­nage which, when dark­ness fell, attracted some­thing ter­ri­fy­ing: A roam­ing pack of feral vampires–mindless feeders–who fell upon the sol­diers left wounded and dying in No Man’s Land. Attacked by the fer­als, Narain was trans­formed into the other type of vam­pire: A sen­tient capa­ble of mov­ing about in soci­ety with only a few restric­tions and able to feed with­out killing the host. After the death of his long-term partner and food source Sophie from cancer, Narain, now a successful chef and businessman, albeit with an unusual set of problems that make life in "normal" society difficult, has reached a crossroads in his life as a sentient vampire. His growing attraction to Cassie Lambert, a scientist with an unexpected link to his past, the re-emergence of Reginald Jameson, his old captain in WWI and now a sadistic predator who shares the night with Narain, and a new, terrifying breed of vampire; Boris, a monster who destroys everything in his path. All these events will conspire to drag Narain into a climactic struggle. A struggle against everything he holds dear, against himself, against Jameson, Boris and the forces that will stop at nothing to discover the secret Cassie has learned about the nature of Vampirism. To ask other readers questions about To Touch The Sun, please sign up. Anyone who likes to get their fangs into a good vampire story will fall in love with this book. To Touch The Sun puts a fresh spin on the old ‘immortal living in a mortal’s world’ tale and weaves a well constructed collection of characters together in a truly enjoyable way. Narain, our protagonist, is instantly likeable and his sense of good natured humour contrasts nicely with dark reality of ‘living’ with vampirism. If you enjoy an extra pinch of science, a dash of dastardly deeds and a good do Anyone who likes to get their fangs into a good vampire story will fall in love with this book. If you enjoy an extra pinch of science, a dash of dastardly deeds and a good dollop of rich character development with your serving of supernatural stories this book is well worth a read. "It is appropriate to concede that there is indeed a category of fiction that dedicates itself to the myth and romance of vampires." "The novel’s characters were perfectly likeable, with the exception of one darling, who Enright constructed in a frame of appropriate understanding–a lovely surprise at the simplest character being the most redemptive for the book." "With characters that made me smile... Enright has ventured into interesting territory, offering readers a bit of science to complement "It is appropriate to concede that there is indeed a category of fiction that dedicates itself to the myth and romance of vampires." "With characters that made me smile... Enright has ventured into interesting territory, offering readers a bit of science to complement magic and myth." 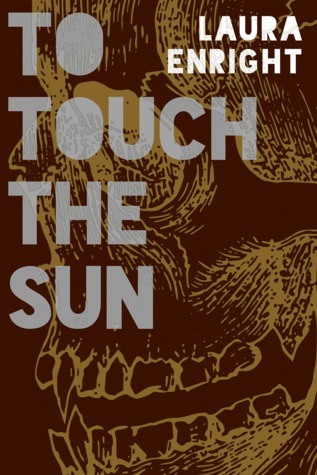 To Touch the Sun is a gripping tale that steps away from the romanticism of being a vampire, and makes you think twice about what it is to have an immortal existence thrust upon you, whether you want it not. In a refreshing new approach to the vampire genre we meet three vampires, all turned during the bloody battles of the World War, and how, having each followed a very different path, they’re suddenly thrown back together again. Reg Jameson is the mercenary who’s made a profit out of him immortality, when his family sees the economic benefit of an ageless patriarch to keep affairs in order. Narain Khan is the romantic, all he’s ever wanted to do was cook for people and bring them joy. Having found a human lover, he’s the adaptable one who’s made a normal life for himself. And then there’s poor Fred Blythe, whom, in both life and … afterlife, has been the one to absorb all of Jameson’s twisted cruelty. Despite a tempting taste of freedom all Fred wants is the nightmare to end. In a story that explores the different vampire mutations within the species, these three former comrades are all brought together once more by a woman, whose lifetime of research may have discovered a formula to could change or, ultimately, end their existence. The story is beautifully written, bringing each vivid character to life; to read this book is to realise that even the scariest monsters have something to fear. There is some indulgent back story within the book, which does encourage skimming, but I recommend you to stay with it, as it will help you discover the bigger picture. And there’s even room for a sequel. Enright has put her own intriguing spin on the origin of vampires, which I won’t spell out as it’s more fun to read in the book, but suffice to say it was a great plot-driver as well as motivation-driver for the characters. Story-wise, it did not disappoint. It’s pulse-quickening action v. thoughtful characterisation v. angst & introspection. It has a charismatic nemesis, powerful threat elements and tension. It was very vivid and excitingly paced. If you’re after something fun and original Enright has put her own intriguing spin on the origin of vampires, which I won’t spell out as it’s more fun to read in the book, but suffice to say it was a great plot-driver as well as motivation-driver for the characters. Story-wise, it did not disappoint. It’s pulse-quickening action v. thoughtful characterisation v. angst & introspection. It has a charismatic nemesis, powerful threat elements and tension. It was very vivid and excitingly paced. If you’re after something fun and original and are a fan of your blood suckers, I would highly recommend. If anything let it down, I feel I have to say, it was the language. I did read on despite this, a testament to its hook and pace, but I thought it was over-told, over-explained and contained too much exposition. I’ll reiterate that the narrative has everything it needs for a fun story: good characters, good action, good pace, intriguing plot. Unfortunately, for me, I felt like I was being told what to think about the character’s actions and thoughts and attitudes, when what they did or said would have done more than enough to lead me to the same conclusion. The story certainly isn’t missing anything, but, for me, I would have enjoyed it even more if the language had been cut back and the story had been allowed to breathe. I urge you to check it out for yourself and see what you think. I also feel there is more to tell of these characters’ tales too, so we can look forward to more on this intriguing spin on vampirism from Enright in the future. Narain Khan was a simple man with a dream. He wanted to be a chef. He knew in order to reach that goal, he'd have to leave India. Narain signed up to join the war. His family didn't want him to go, but it would be a step toward his goal. Narain didn't know how drastically his life would change. Now at 90 years of age, he still looked 30. Of course being a vampire had it's advantages. A world renown chef, Narain owned his own restaurant and could create new recipes whenever he chose. If only li Narain Khan was a simple man with a dream. He wanted to be a chef. He knew in order to reach that goal, he'd have to leave India. Narain signed up to join the war. His family didn't want him to go, but it would be a step toward his goal. Narain didn't know how drastically his life would change. Now at 90 years of age, he still looked 30. Of course being a vampire had it's advantages. A world renown chef, Narain owned his own restaurant and could create new recipes whenever he chose. If only life were as simple as it seemed. The past has a way of coming back to haunt you and Narain was being pulled back into the middle of his. Very intricately plotted and detailed and characters with life and breath will draw you to this book. The beginning is amazing! The description of leaving his family is heartbreaking. Unfortunately, then it takes a very slow turn and tends to wander around. This book is extremely technical. It delves into the very specific and scientific reasons behind vampirism. I think you'll love this book just the same. I did find issues. I would love to have read why and when Narain was turned in the beginning. It would have made so much more sense to the story. I also think the chapter long explanations of his past were unneeded. Sprinkle the past throughout and you get a better balance. I received this book in exchange for an honest review LoP (Lovers of Paranormal). This story was a different take on vampires and their origin. Narain was a complex and interesting character in the sense that he has so much guilt about what he is and has done it makes him seem more human than any of the other vampires. The other characters have a lot of personality, which was interesting as well. This is a well written, emotional, feel-good vampire story. If that is even possible! It makes a pers I received this book in exchange for an honest review LoP (Lovers of Paranormal). This is a well written, emotional, feel-good vampire story. If that is even possible! It makes a person appreciate the family they have now. The ending was shocking and abrupt, but it just makes me want to read the next book more. vampires in the book To Touch the Sun. It is engaging and very well written. The story has the perfect balance of romance and intrigue. or to anyone who would just like to read a great story! I really liked the personalities that the author gave each character. The way the book is written, I could easily imagine what each character and their surroundings looked like. This was a very good book. I love a good vampire story as much as the next guy. In fact, they are one of my favorite sub genres-spanning the gauntlet from horror, to dark fantasy, to romance even. Whether it be films such as Blade, Underworld, Interview With The Vampire, or even Bram Stoker's Dracula-I find them all fascinating and wildly entertaining. In literature, I have read many short stories featuring vampires. Recently, I have even started to dabble in the Stephen King graphic novels American Vampire. As far as full fledged novels go, those that I have read are much fewer. Pandora by Anne Rice was one of my favorites. However, I was pleasantly surprised by how well written and engrossing our very own Joleene Naylor's Shades of Gray was. So, it was with some trepidation that I endeavored to read To Touch The Sun. This will mark my third book that I have reviewed for Dagda Publishing. It was actually sent to me by Dagda in the same email as All Hail The New Flesh. Surprisingly, To Touch The Sun turned out to be a real charmer. The main character, Narain Kahn, is very well developed and the reader will have instant sympathy for his plight. Though already a vampire at the beginning of the story, we soon find out Narain's origins from India, as well as his love for cooking. The very idea of a vampire becoming a well renowned chef brought a smile to my face. Cassie, the female lead character, befriends our burgeoning culinary master. As it turns out, she is not at all distraught over Narain's condition as one of the undead. In fact, she is a blood scientist and relative to one of Narain's human friends from many years ago. No story would be complete without a villain and Reg Jameson fits that role rather insidiously in To Touch The Sun. The back story of how Narain and Reg came to know each other before either one was transformed into creatures of the night, was perhaps my favorite part of this story and best left for you to discover on your own. Although some aspects of romance come into play, To Touch The Sun is definitely no Twilight by any means. The reader will be treated to bouts of violence in sudden and abrupt bursts. The reality of the condition of vampirism undoubtedly dictates the need for blood and Enright does not disappoint. Other aspects of this story that gives it a slight uniqueness in the sub genre is the concept of sentient versus feral. This is also best left to discovery during the reading process, so I will indulge you no further on this subject. All in all, To Touch The Sun is a delightful read. The main characters are developed enough to have the reader's interest well invested and the action sequences will keep eyes glued to the pages. If I had one qualm with this book, it would be the amount that is dialogue driven. I love good dialogue and To Touch The Sun has plenty of it. However, I also love books that are endowed with superb visualization. To paint a picture with words is something that I long for when reading a story. Enright accomplishes both to some degree, but the latter could use a little more emphasis. Still, To Touch The Sun is a very entertaining read filled with great characters and a story line that sets it apart from other vampire tales. I hope that you can find the time to give this great story the attention it deserves. I'm not sure where all these positive reviews are coming from, but they are certainly not doing this author any favors. To Touch the Sun is an extremely overwritten piece of genre fiction-- dense storytelling where most things are told rather than shown. Though the book is under 200 pages, it feels like 400. It leaves the reader with the impression of something that was never professionally edited. It doesn't help that the typeface is so small that reading it becomes a merciless chore. The idea o I'm not sure where all these positive reviews are coming from, but they are certainly not doing this author any favors. To Touch the Sun is an extremely overwritten piece of genre fiction-- dense storytelling where most things are told rather than shown. Though the book is under 200 pages, it feels like 400. It leaves the reader with the impression of something that was never professionally edited. It doesn't help that the typeface is so small that reading it becomes a merciless chore. The idea of vampirism explained through "science" is nothing new, but if your idea of originality is a skateboarding vampire named Boris (after Karloff), then you may appreciate its novelty-- if you can get through the dumb banter, forced humor, and flat action scenes that sound as though they were inspired by a bad slasher movie and written at the high school level. I realize that most audiences don't demand much in their genre fiction-- look at the popularity of the "Twilight" series-- but at least a Stephenie Meyer or an Anne Rice possess a narrative clarity that To Touch The Sun does not have. The storytelling is so dense I was thrown off by the first meandering paragraph. Also, with page one's reference to "the latest in cool toy technology" it's a warning sign of a writer wanting to write in the first person but confusing it with the voice of the overall storyteller. The story might've been better served had it been developed into two sections: Narain's journey from India to the trenches of the Western Front and then his later conflict with his commanding officer in present-day Chicago. Half the characters could've been eliminated-- including the references to Sophie, a character important in the life of Narain but who is never clearly drawn for the reader. I was also surprised to discover this author is from Chicago given the number of British spellings throughout; but it was apparently published in the UK. The book ends with a hook which I won't reveal, but if a sequel is forthcoming, I hope the writer streamlines the process-- and settles on a less pretentious title! I admit it. I read a lot of vampire books. Some are bleh and some are great. To Touch the Sun is one of the great ones. I was privileged to read an advanced reading copy and now am dreading having to wait for the next book in the series to come out because it will take much too long! Nahrain is a wonderfully complex character. You immediately fall a little in love with him and the life he leads. This is not a sappy love story nor is it a horror filled angst ridden tomb, but rather a perfect blen I admit it. I read a lot of vampire books. Some are bleh and some are great. To Touch the Sun is one of the great ones. I was privileged to read an advanced reading copy and now am dreading having to wait for the next book in the series to come out because it will take much too long! Nahrain is a wonderfully complex character. You immediately fall a little in love with him and the life he leads. This is not a sappy love story nor is it a horror filled angst ridden tomb, but rather a perfect blend of mystery, history, romance and action. It reminds me in many ways of Robin McKinley's Sunshine in that it takes the whole vampire novel to a new level. The novel has rich character development, but doesn't drag with unnecessary descriptions. The action is intense, but not overdone and you see Nahrain for what he is: a man (ok vampire) conflicted and trying to come to terms with his past while trying to protect the world and right past wrongs. There is something in the book for everyone. Plus, it's set in my home town which is pretty cool. In Laura Enright's novel To Touch The Sun (published by Dagda Publishing), she revisits some old vampire lore: how they were made in WWII (some people have said that before) and how some vamps just want to be human. Narain left India to become a chef, getting to America by becoming a soldier. But when he's left to die in No Man's Land, he's turned into a vampire but had some differences: he's not feral and can move about in society. He can also drink blood without turning the host. When his belove In Laura Enright's novel To Touch The Sun (published by Dagda Publishing), she revisits some old vampire lore: how they were made in WWII (some people have said that before) and how some vamps just want to be human. When his beloved companion Sophie passes away, he findsa new love, the scientist Cassie, but can she hurt him more than he thinks? And when his old CO--now a bloodthirsty vamp himself--finds him and a killer feral named Boris starts slaughtering people in Narain's home of Chicago, things go from bad to worse. Ms. Enright wrote a great book with a very emotional lead character. Her knowledge of WWII and India help in enriching the story but, ultimately, it's the emotional tear in Narain's psyche that makes this story so great. Her talent is vast and can go from a brutal murder on one page and a romantic dance on the next. A gripping tale that steps away from the romanticism of being a vampire, and makes you think twice about what it is to have an immortal existence thrust upon you, whether you like it not. In a refreshing new approach to the vampire genre we meet three vampires, all turned during the bloody battles of the World War, and how for each of them, having followed a different path, are suddenly thrown back together again. The mercenary who’s made a profit, the adaptable who’s made a life and the lost and lonely who just wants the nightmare to end. Brought together by one woman, whose lifetime of research may have discovered a formula to that could change or, ultimately, end their existence. Adding a clever twist to all the popular vampire legends, Laura shows how even a well-worn genre can still carry a good story. I did find myself wondering how a vampire could become a successful chef without ever seeing the sun – o I’m not usually a fan of vampire novels, so they have to be a bit different to hold my attention. To Touch The Sun, by Laura Enright was different. I liked the linking back to the horrors of the First World War – and the pseudo-science I was almost starting to believe. I was given a copy of this book in exchange for my honest review: Lovers of paranormal. If you are interested in a vampire story that does not contain the run-of-the-mill, all powerful, indestructible, hopelessly immortal creature that vampires are normally cast as, then To Touch The Sun is for you. The unique way in which the author used science to approach vampirism as a condition adding in possibly logical explanations was one of the major selling points of this story. The author took her tim I was given a copy of this book in exchange for my honest review: Lovers of paranormal. The author took her time developing a plot that fit and flowed from beginning to end and then added characters that perfectly added beef to the story. `To Touch the Sun' written by Laura Enright is start a new series of novels about vampires. Therefore all `Twilight' fans beware; this novel was created in inventive and skillful way that additionally offers lot of exciting adventures. Or as one of fellow colleagues said, it's all about vampires wrapped in story full of suspense. Because of that, and given that book delivers good story and few twists and turns, I can recommend it to all the readers interested in vampires. `To Touch the Sun' written by Laura Enright is start a new series of novels about vampires. Therefore all `Twilight' fans beware; this novel was created in inventive and skillful way that additionally offers lot of exciting adventures. Or as one of fellow colleagues said, it's all about vampires wrapped in story full of suspense. This one had definite potential with its more rational, scientific approach to vampires, but the execution was somewhat lacking for me. I just found the writing to be very heavy, very dense, as if she were trying too hard to force the narrative. The characters were interesting, and seemed to have some real depth, but the physical action often felt awkward.